Remember my summer-inspired Smoky Grapefruit Cocktail? Well, it also inspired a summery salad! 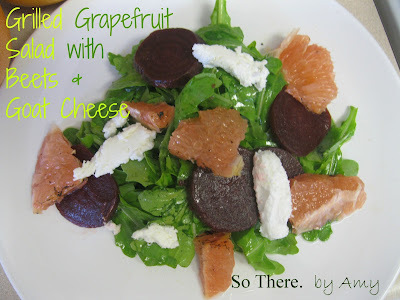 I love fruit on salad, and I also am obsessed with beets and goat cheese, especially with a peppery arugula. Arugula is a peppery, leafy green that pairs great with cheese, such as goat cheese or freshly shaved Parmesan. 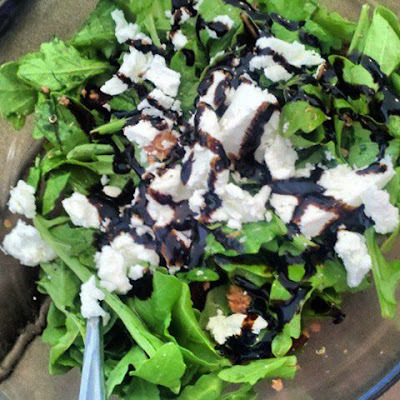 I made a salad dressing with olive oil, balsamic glaze, a touch of honey, and some grilled grapefruit juice. Combine all and mix until smooth. Toss dressing with arugula and sliced beets. I use the ready-to-eat boiled beets from Trader Joe's. If you begin with whole, raw beets, peel and boil or roast until tender. Add sections of grilled grapefruit and crumbled goat cheese. Simple, and bursting with wonderful flavor. The smoky flavor of the grapefruit being grilled adds another element to this dish. ..This was so good, I had it two night in row, but night numero dos I went a little crazy with the goat cheese and balsamic glaze! YUM! ...I swear there are beets and grapefruit under there somewhere.